3 R’s for Optimal Happiness & Well Being! I’m about to tell you how come it’s imperative to Release, Relax & Recharge throughout each day at home and in the office to create optimal happiness and well being. Perhaps you are aware that the following tips below are stress relievers- and now I’m suggesting you do them often during your day. Check in with yourself; inner”traffic control” throughout waking hours – and that will help you have a peaceful night as well :). Stress is cumulative. Extreme frustration and stress left to fester can easily lead to inappropriate outbursts of anger violent or depressive episodes on the other side of a continuum. When you are feeling stressed, overwhelmed, unappreciated, angry it’s important to take time out to release, relax and recharge. When you are experiencing difficulty meeting multiple job responsibilities and target dates, juggling personal and business responsibilities and having relationship challenges it’s important to take time throughout each day to recharge. The suggestions below will have positive effects on your happiness and well being. ***Take 3 cleansing breaths by inhaling deeply through the nose, belly rising. Sustain the inhalation, then exhale (through mouth, belly deflating), making the exhalation forceful and sustained, like a sigh. This temporarily changes your physiology and can be the beginning of a sustained relaxation. De-Clutter stuff & decrease ‘visual noise’! SOAR! with Resilience® and contact me for a complimentary twenty minute telephone consult! How EFT “Borrowing Benefits” Works for Everyone! What is the best way to prevent workplace violence? Overcome Workplace Stress with Mindfulness PracticesCommunicate Effectively for Fulfilling, Successful Relationships! I’m excited to be presenting these 10 Tips to Public & Private Groups and Via webinar. 4. Forgive yourself for mistakes, let go and move on. Self-forgiveness is essential in order to forgive anyone else. Forgiveness is essential to let go of anger. Letting go of anger is essential to be happier. We need our “down” time more than ever now, living in these difficult times. Honor your method of relaxation and allow dreams to surface. Be open to learning additional relaxation techniques and give them a try.. whatever works for you whenever you do it is OK as long as it has no negative effects on health or overlap with personal or work responsibilities. If things are unmanageable – get help. Stress takes its toll on health and may exacerbate conditions already in existence. 8. Stop procrastinating and take action- to move forward or to drop the project. Infuse your life with happiness one smile at a time! A little bit crazy? Try tapping (EFT) for stress relief..
of peace where I love to be for part of my day..
significant shifts in stress relief and attitude. attention to what comes up for YOU. stress about a situation, tap on that specifically. personal stuff, the better results you’ll have. Under Mouth: I’m overworked and stressed out…. Eyebrow: I chose to slow down…. Side of the Eye: I chose to breathe…. Under Eye: I am perfect as I am…. Under Mouth: I don’t have to be like anyone else…. Top of the Head: It’s all within my control…. I offer a complimentary consult via phone or skype to re EFT ansd Peak Performance Success Coaching with several packages available to help empower you to be your happiest, most productive self. CONTACT ME FOR A FREE CONSULT: eileen@balanceandpower.com http://www.balanceandpower.com/eft. Sometimes it’s indicated to release a project or detail in the pursuit of the big picture. Procrastination and perfectionism can be “time vampires-bandits-thieves-robbers” so I recommend being on the look-out for them and conquering related issues. 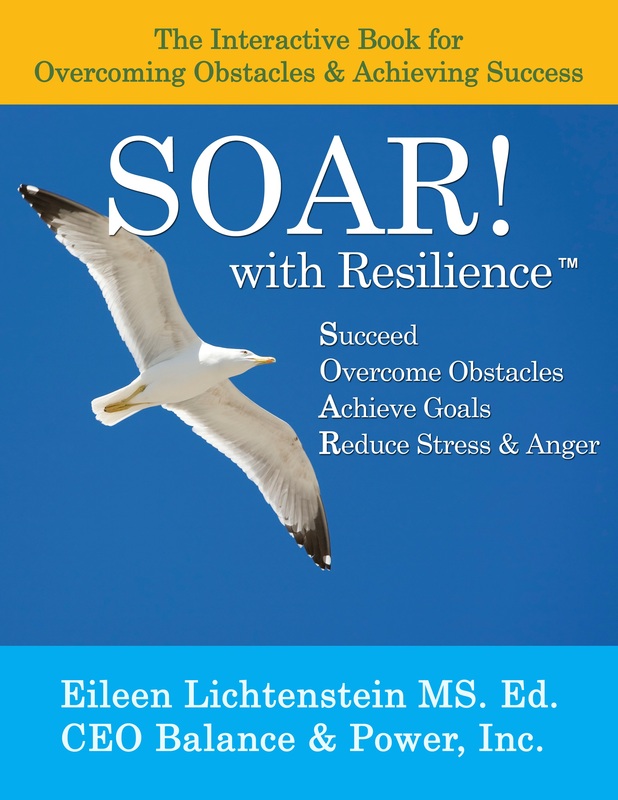 You may call-email me for a complimentary 20 minute consult to “SOAR! with Resilience” towards peak performance, goal setting and happiness and to learn about how EFT can help with goal setting and actualization. We can feel more purposeful, focused and positive about our work by regularly giving ourselves the gift of recreation and relaxation. We may think that we need to stay focused and disciplined until we get the job done, especially if we are working hard on achieving the goals we’ve set for ourselves. While this level of dedication is admirable, it can also sabotage our enjoyment of our work and also the efficiency and accuracy. Choosing to create a state of balance and moderation in our activities will help us enjoy our daily experiences more. This helps us be more focused and productive when we are working. Remember that a rested mind is an efficient mind. Take time to honor your need for fun today, and you will help yourself achieve your goals. A good night’s sleep is also extremely important to attain optimal productivity. I recently won a great raffle at Yvonne Bisk’s Meet-Up Group: http://www.meetup.com/LongIslandEntrepreneurs/ , the book “Delivering Happiness” by Tony Hsieh, CEO, Zappos.com. Inc. that happily reading now! Tony is a huge advocate of work-life balance and taking time off to allow the creative juices to work. Thanks Yvonne, for spreading the good words! EFT Emotional Freedom Techniques, tapping, is extraordinarily fantastic in facilitating focus!! If you need help with any of this, you may contact me for a 20 minute complimentary coaching consult and find out how my services work for you!